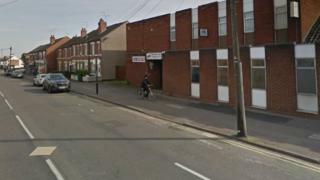 A man has died after he was knocked down by a car which failed to stop, West Midlands Police said. The 83-year-old was crossing Foleshill Road in Coventry at about 22:10 GMT on Thursday when he was struck. The force said the man had just left the Parkstone Working Men's Club. Police have arrested a 27-year-old man from Coventry on suspicion of causing death by dangerous driving and failing to stop at the scene of a collision. A West Midlands Ambulance Service spokesman said the man was confirmed dead at the scene. Sgt Alan Wood, from the West Midlands Police Collision Investigation Unit, said: "Our thoughts are with the family of the man who lost his life when he had just been enjoying a pleasant evening with his friends. "We are trying to establish exactly what took place and are keen to hear from anyone in the area at the time who may have seen what happened."